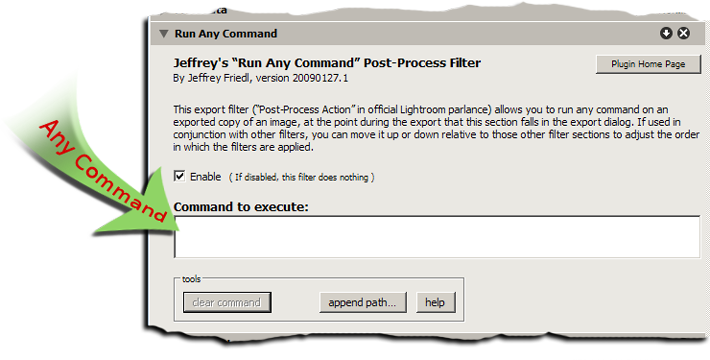 Well, the Lightroom plugin that I released yesterday was mostly a waste of time, but a commenter reminded me that I still hadn't written a “Run Any Command” plugin for Lightroom 2, to complement the piglet of the same name that I released for Lightroom 1 just over a year ago. I'm sure I'll eventually add the ability to create and recall presets, but that will have to wait for another day. Great! This feature was really missing from Lightroom 2. I use it with exiftool in order to add a system tag with the picture’s original filename to the image files I upload to Flickr.